In the aftermath of a divisive presidential election, the American people are united in their belief that the campaign was – and our culture is – uncivil, according to the seventh annual Civility in America poll conducted by Weber Shandwick and Powell Tate with KRC Research. This unified outlook on the state of civility in America, not surprisingly, divides along partisan lines in terms of who is responsible, how uncivil the presidential candidates were and the likelihood that our national civility “crisis” will ease anytime soon. A record high 69 percent of Americans believe that the U.S. has a major civility problem, a view shared equally by people who voted for Donald Trump or former Secretary of State Hillary Clinton. Seventy-five percent say incivility has risen to crisis levels, with Clinton voters more likely to have that view than those who voted for Trump (81 vs. 72 percent, respectively). Among the nearly six in 10 Americans (56 percent) who expect civility to get worse in the next few years, nearly 9 in 10 Clinton voters (89 percent) named politicians as the group most responsible for the decline in civility, followed by the Internet/social media (69 percent) and news media (51 percent). Trump voters blamed the news media (77 percent), demonstrators/protestors (76 percent) and the Internet/social media (75 percent). Only 28 percent of Clinton voters saw demonstrators or protesters as a leading reason for the erosion of civility in the years ahead. Only 53 percent of Trump voters cited politicians. While citing the media for contributing to the nation’s incivility, both Trump and Clinton voters said broadcast/cable news and the Internet/social media are by far their leading sources of news about national politics. Eighty-three percent of Trump voters and 88 percent of Clinton supporters said the media is obligated to report when a public official is lying. There was also agreement on the uncivil nature of the 2016 presidential campaign. By nearly a 4-to-1 margin (79 vs. 21 percent), Americans found the election uncivil. While substantial majorities of Trump and Clinton voters (72 and 83 percent, respectively) viewed the campaign as uncivil, there was significant disagreement in the two camps about the civility of the two candidates. 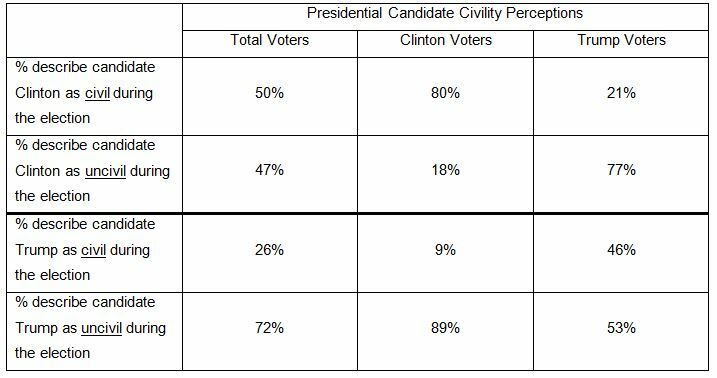 Voters were equally divided over Secretary Clinton’s civility (47 percent uncivil vs. 50 percent civil), but views differ between Trump and Clinton voters. Eighty percent of Secretary Clinton’s supporters saw her as civil, with only 18 percent saying she was uncivil. Of Trump’s voters, 77 percent said Clinton was uncivil against 21 percent who thought her civil. As a candidate, Trump was viewed as uncivil by 72 percent of American voters, with only 26 percent finding his candidacy civil. Even a majority of his voters (53 percent) found him uncivil vs. civil (46 percent). Clinton’s voters found Trump more uncivil (89 percent) than civil (nine percent). While majorities of both Trump and Clinton voters said civility was an important consideration in their decision to vote for their candidate, the two camps split in their willingness to accept uncivil campaign rhetoric. Although only a third of Americans (31 percent) agreed that “there is nothing wrong with a politician saying what is on their mind, no matter how uncivil,” there was a pronounced difference in the opinion of Trump and Clinton voters. Nearly half of Trump voters (48 percent) agreed with this statement while only one out of five Clinton voters (21 percent) did. “What these findings suggest is that some of candidate Trump’s campaign rhetoric that was criticized as uncivil was interpreted as appealing, tell-it-like-it-is authenticity to many voters,” said Pam Jenkins, President of Powell Tate. Looking beyond the presidential campaign to the new president’s administration, voters were all but unanimous in saying it’s important for a president to act in a civil manner, with 97 percent of Trump voters and 99 percent of Clinton voters agreed on that point. The voters agreed that political incivility affects the reputation of the U.S. (86 percent); that uncivil comments by political leaders encourages greater incivility in society (79 percent); that incivility leads to less political engagement on the part of the American people (75 percent); that the U.S. is losing stature as a civil nation (73 percent) and that incivility deters people from entering public service (59 percent). These views were held by majorities of both Trump and Clinton voters. The incivility of the presidential campaign kept some people from going to the polls altogether: Incivility was cited by 59 percent of non-voters as either a major factor (41 percent ) or minor factor (18 percent) in their decision not to vote in 2016. 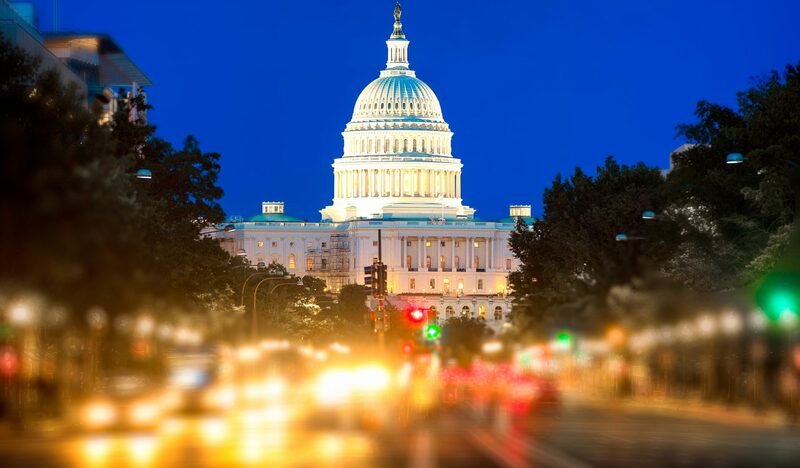 “The American people are aware of, and worried about, the consequences of the incivility that has infected our society and political process,” said Jack Leslie, Chairman, Weber Shandwick. Optimism that the nation will become more civil in the years ahead followed people’s voting patterns with 84 percent of Trump voters hopeful about the future of civility in America, compared with only 27 percent of Clinton voters. The seventh annual Civility in America survey captures the American public’s views on civility in society. Subsequent reports on civility as it relates to personal interactions, the workplace and solutions for fostering a more civil public discourse, will be released in the coming months.